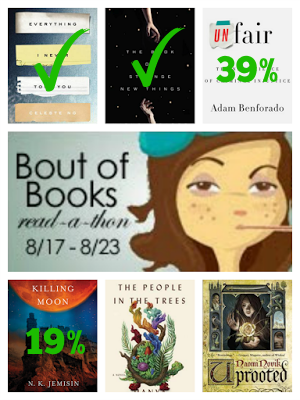 Bout of Books 14 has come and gone, and I did ALL of the reading last week. I'm very happy with my stats, especially considering that I read exactly nothing on Friday (Exploding Kittens can be kind of distracting) and spent Saturday evening at a jazz festival and bar. I participated in only one mini-challenge, but it told me I'd be hanging out in Middle Earth with a billion cats, so that's worth all the mini-challenge prizes put together in my opinion. I'm at home today after a long week of feeling physically and emotionally off. Maybe I had a "bout" of something.. eheh... *crickets*. I plan to spend my day off doing whatever peaceful activity strikes my fancy, and there will most likely be plenty of reading. Both of my unfinished BoB reads are calling my name, especially Jemisin's high-fantasy wonderland/nightmare world of Gujaareh (another tick in the "Julianne made me do it" box). That's all she wrote today, because she'd rather be napping. What are y'all reading this week?